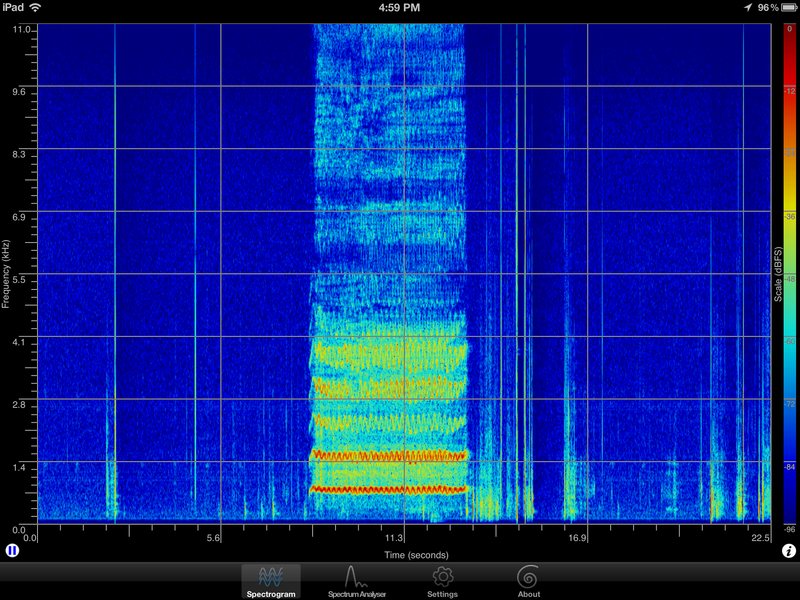 A while back, I was at a rehearsal of Aida, sitting around while the tenor was singing “Celeste Aida.” Just for kicks, I fired up the free MeionSpector app on my iPad to watch the live spectrogram roll by as he sang. When he hit the high B-flat at the end, I took the screenshot shown to the left. I’m an engineer by training, so I love this kind of geeky stuff. When I began studying solo classical voice, one of the most difficult concepts I had the most difficult wrapping my head around was “color” in the voice – referring, in this context, to the strong presence of certain overtones. I didn’t understand the difference in sound between when those overtones were present and when they where absent. I didn’t understand what overtones sounded like in other singers’ voice, and I definitely didn’t understand what they where supposed to sound like in my own voice. I think that if I had had an app like this just to play around with, it would have given me a little bit of insight and helped me understand this concept a little faster. In the screenshot above, the various fuzzy horizontal-ish black bands correspond to all the different frequencies that are present in the tenor’s voice when he’s singing high B-flat as the fundamental pitch. The B-flat corresponds to a frequency of about 466 Hz (you can look up the frequency of a pitch with an app like Pitch Freq 2). If you look for the approximate location of 466 Hz on the tick marks on the left edge of the image, there’s a lot of heavy black squiggle in that area, since it’s the fundamental. The rest of the narrower horizontal black bands above it are the overtones, and they should appear in the locations determined by the overtone series. Knowing this, I can use the app for real-time visualization of the overtones in my voice. I can sing a note, see the overtones, and modify my vocal production until the upper bands disappear, leaving only the fundamental and resulting in what many teachers and singers refer to as a “white” sound, and then bring the overtones back again. I can experiment with different things in vocal production and see how they strengthen or weaken the overtones, and which overtones are affected. It’s certainly not a silver bullet for learning vocal technique, but it can be an interesting exploratory tool that might yield a few insights. I wouldn’t view it as a precision instrument for scientific measurements either, as I don’t know the limitations of the app software or the iPad’s audio hardware for capturing everything in the singing human voice, but if you need something more scientific, there’s always VoceVista and the associated hardware. One other fun and educational thing you can do with this software is feed the voices of other singers into it. Below is a screenshot of VoceVista being used to analyze the same B-flat in “Celeste Aida” sung by Domingo (top half) and Pavarotti (bottom half). VoceVista’s website has a discussion of how to interpret the graph and use it to understand the difference between Domingo and Pavarotti’s resonance strategies. At a more prosaic level, there are similar apps that show your signing against a pitch scale to help you determine when you sing off key. For many years, I used the free (demo) version of Melodyne for this purpose. Recently I heard of another called Tartini, but I haven’t tried it yet. There are probably others. Another useful rec. Thanks again – will try these out!